Left: photo by Jenn Burt. 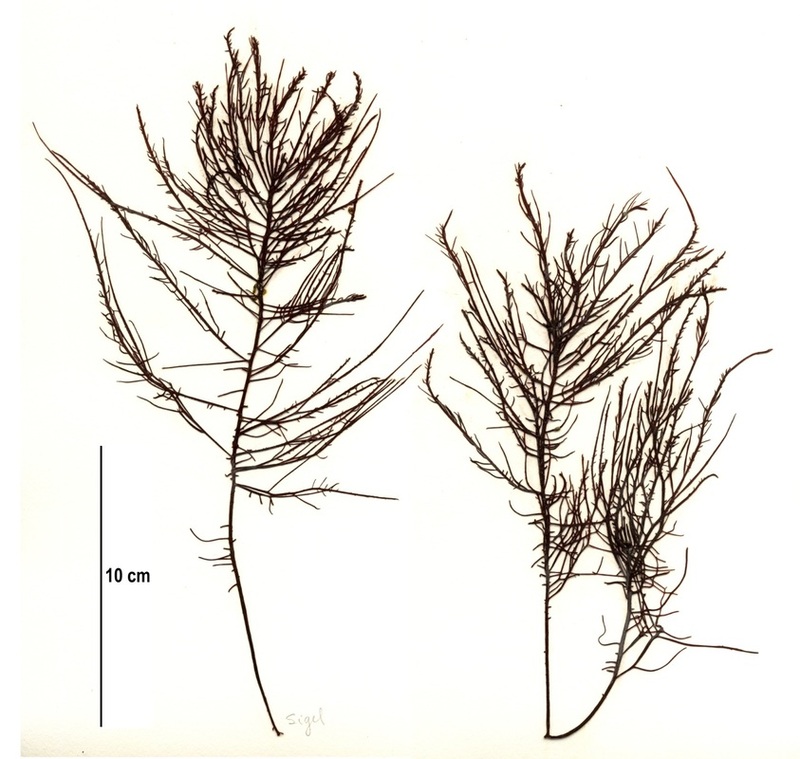 Right: specimen collection number SCL 15313 in the UBC Herbarium Algae Database. Search the collection number in the database for more information on these specimens, or search the species for further occurrences. Images courtesy of Sandra Lindstrom. 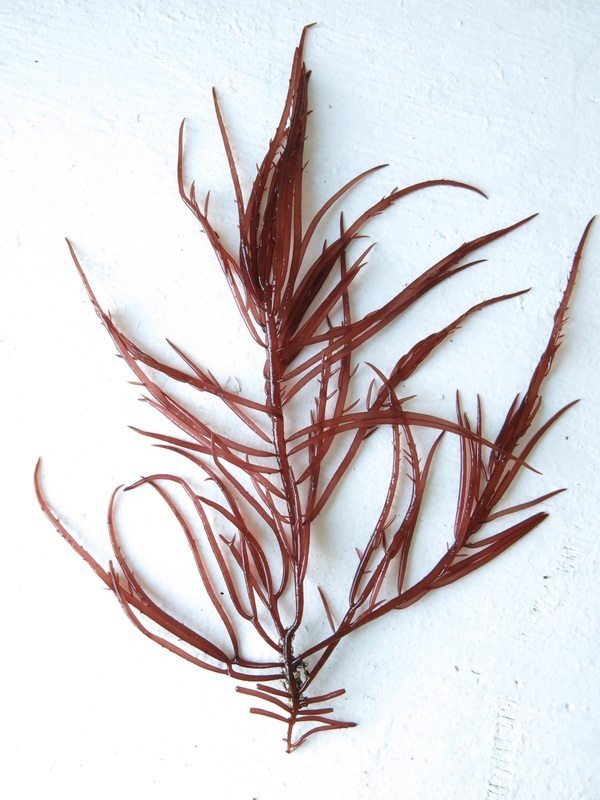 The thallus of this red seaweed is composed of cylindrical, fairly brittle branches that taper towards their tips and towards their basal branching point. Branching may be opposite or from all angles of the main axis (radial). This species' colour varies from light pink, to dark red or reddish brown, to straw yellow when bleached in summer. It grows 10-40 cm tall. Sarcodiotheca gaudichaudii grows on rock and other hard substrates, particularly small stones and shells, in the lower intertidal to upper subtidal. on the west coast of North America its recorded range extends from Alaska to Baja California. It has also been recorded in parts of South America, as well as Britain where it was likely introduced. The above specimens were found growing on rock embedded in sand, on Calvert Island's North Beach. Guiry, M.D. & Guiry, G.M. (2016). Sarcodiotheca gaudichaudii (Montagne) P.W.Gabrielson. AlgaeBase. National University of Ireland, Galway. Accessed 19/04/2016. Watanabe, J. ​(2014). Phylum Rhodophyta: Rocky Shore Red Seaweeds. 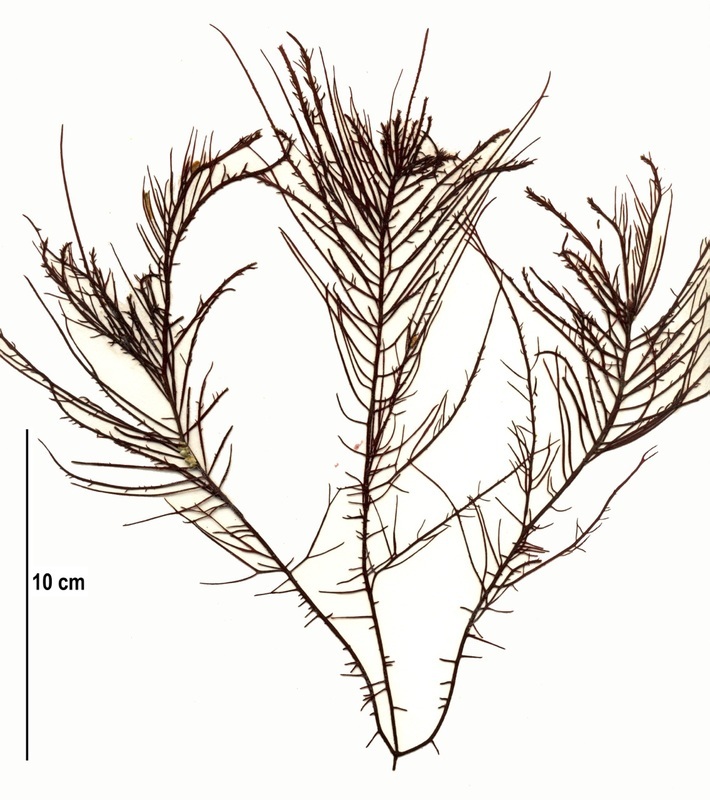 SeaNet: Common Marine Organisms of Monterey Bay, California​. Stanford University, Stanford CA. Accessed 19/04/2016.